At the Boston Museum School he met his wife, the artist, Allyson Rymland Grey. During this period he had a series of entheogenically induced mystical experiences that transformed his agnostic existentialism to a radical transcendentalism. The Grey couple would trip together on LSD. Alex then spent five years at Harvard Medical School working in the Anatomy department studying the body and preparing cadavers for dissection. He also worked at Harvard's department of Mind/Body Medicine with Dr. Herbert Benson and Dr. Joan Borysenko conducting scientific experiments to investigate subtle healing energies. 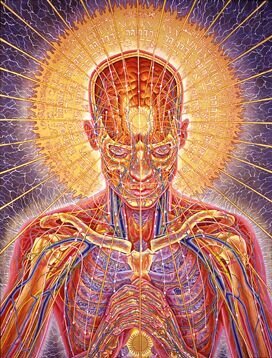 Alex's anatomical training prepared him for painting the Sacred Mirrors (explained below) and for doing medical illustration. When doctors saw his Sacred Mirrors, they asked him to do illustration work. Grey was an instructor in Artistic Anatomy and Figure Sculpture for ten years at New York University, and now teaches courses in Visionary Art with Allyson at The Open Center in New York City, Naropa Institute in Boulder, Colorado, the California Institute of Integral Studies and Omega Institute in Rhinebeck, New York. Grey's unique series of 21 life-sized paintings, the Sacred Mirrors, take the viewer on a journey toward their own divine nature by examining, in detail, the body, mind, and spirit. The Sacred Mirrors, present the physical and subtle anatomy of an individual in the context of cosmic, biological and technological evolution. Begun in 1979, the series took a period of ten years to complete. It was during this period that he developed his depictions of the human body that "x-ray" the multiple layers of reality, and reveal the interplay of anatomical and spiritual forces. 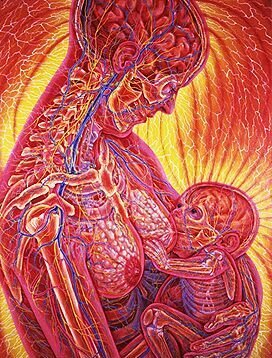 After painting the Sacred Mirrors, he applied this multidimensional perspective to such archetypal human experiences as praying, meditation, kissing, copulating, pregnancy, birth, nursing and dying. Grey’s recent work has explored the subject of consciousness from the perspective of “universal beings” whose bodies are grids of fire, eyes and infinite galactic swirls. 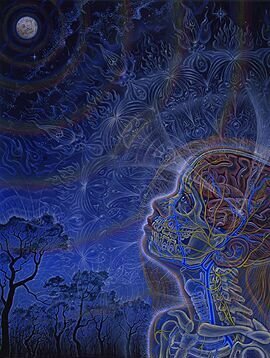 Renowned healers Olga Worral and Rosalyn Bruyere have expressed appreciation for the skillful portrayal of clairvoyant vision his paintings of translucent glowing bodies. 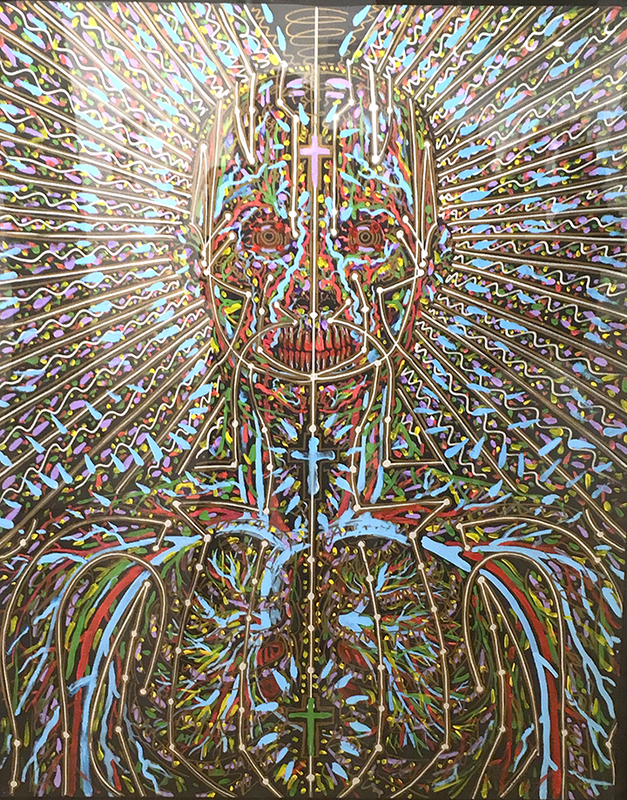 Grey's paintings have been featured in venues as diverse as the album art of TOOL, SCI, the Beastie Boys and Nirvana, Newsweek magazine, the Discovery Channel, Rave flyers and sheets of blotter acid. His work has been exhibited worldwide, including Feature Inc., Tibet House, Stux Gallery, P.S. 1, The Outsider Art Fair and the New Museum in NYC, the Grand Palais in Paris, the Sao Paulo Biennial in Brazil. Alex has been a keynote speaker at conferences all over the world including Tokyo, Amsterdam, Basel, Barcelona and Manaus. The international psychedelic community has embraced Grey as an important mapmaker and spokesman for the visionary realm, .